Excel Financial Management Modeling (Financial Management using Microsoft Excel) allows to quickly becoming proficient with financial management and analysis within Excel. Financial modeling material consists of over 30 video tutorials and over 100 Excel financial management templates. The training videos can be accessed at any time for reference on commonly required solutions for financial management and the Excel templates can be applied to real life financial modeling situations. Training videos are separated into topic areas including financial formulas and functions, charting and dashboard creation, financial statement construction and report analysis, and pivot table reporting. After the video has been completed and optional test can be taken whereby a 70% pass rate provides and certificate for printing and safe keeping. Training and qualification is time efficient with all videos taking 2 hours to view and the assessment test 1 hour to complete. 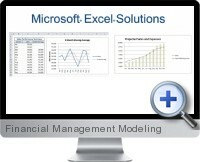 The Excel financial management modeling templates can be downloaded and customized to use on an ongoing basis. The Excel templates are referred to in the video material to assist with applying the ost suitable templates to actual financial modeling needs and situations.